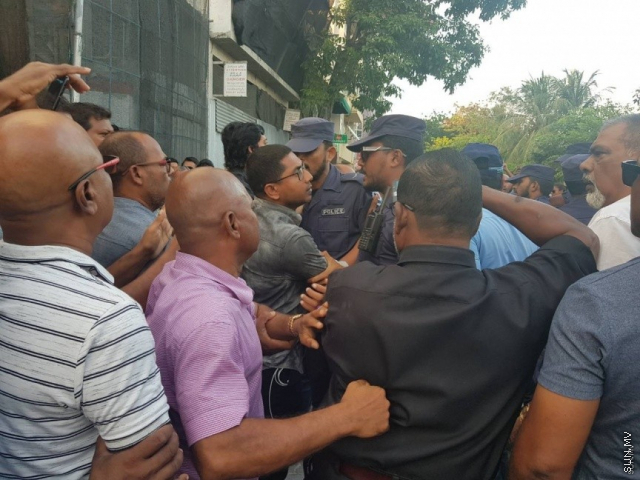 MP for South Galolhu constituency, Ahmed Mahloof has been arrested at the opposition protest rally at Artificial Beach area. Mahloof was arrested inside the MDP campaign hall. So far there have been no comments from the police regarding the arrest. While MP Mahloof has been arrested, police have deployed pepper spray and dispersed the rally. MP Mahloof has previously said that there will be a gift today for those who criticize the government. The opposition rally is held to call on the government to implement the Supreme Court ruling on 1 February. With the rally at the Artificial Beach area dispersed, the people at the rally are now gathering at Maafannu Kunooz.